For the last three decades, women IT professionals have been significantly underrepresented in the tech industry. At larget tech conglomerates such as Microsoft, only 26% of their employees are female, and 74% are male. Furthermore, the media provider Netflix only has 43% of female employees compared to 57% of male employees. If we had a particular level of women in these tech occupations, these ratios would presumably diminish fundamentally. 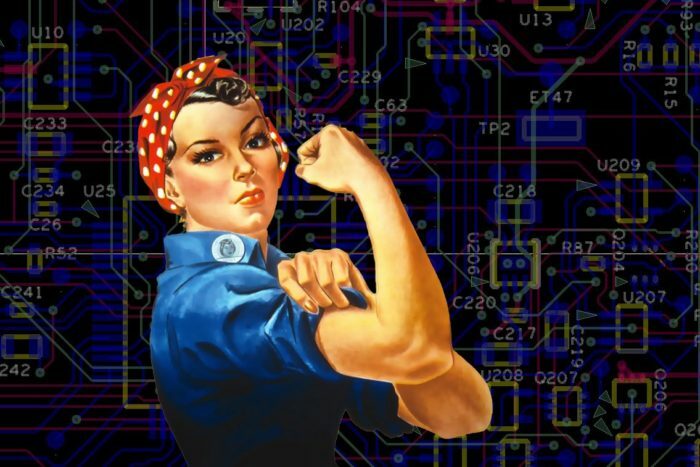 Sometime after 1991, 36% of women were in IT Computing roles. Since that number has dropped to 25%. In 2016 only $1.46 billion was invested in women-led startups, while $58.2 billion was invested in male-led startups. It’s disturbing to see these numbers. Indeed, women are just as talented and passionate as men. I have a mother, and when all is said in done, we as a whole have mom’s, sisters, cousins that we care about. For what reason wouldn’t they be able to get a reasonable shot at entering this field? Despite the underrepresented data, there are a lot of women IT experts from all races and color. If you look sufficiently hard, they’re less difficult to discover than you would anticipate. When working at one of my previous companies, I told my director that I wanted to implement a new KPI metric that required each of our recruiters to have at least 5% of their candidates each quarter to be females. I chose 5% per quarter because I wanted to make it a realistic and attainable metric that was achievable and could be increased over time. I surveyed our US employee headcount of over 5,000 employees and found out that 87.5% of our IT/technical staff were males and only 12.5% were female. You would think that this would be the reverse considering in 1843 Ada Lovelace became the first computer programmer. So, let me show a few tricks if you want to source female IT professionals. You can get a returned search around 31,000+ profiles. I know that’s a lot but, the reason I mention these keywords is that throughout our careers, someone has hopefully provided you with a LinkedIn recommendation. They use some of the words like “her” or “she”. Or other keywords like “She Coded” or “Her Code” will be utilized during the search string that you write. When I add specific job titles, it allows me to narrow down my search from 31,000+ profiles down to 2,931 profiles. I can also write a raw Boolean search with specific OOP Skills along with a job title, and it will allow me to narrow it down and when I add specific geographic locations. This by itself becomes just one of the many custom searches you can perform in which you can use to drill down into a specific number of candidates that you’re sourcing. Or, if you have the freedom to hire remotely and can do a nationwide search and you could pick the Anita Borg example and use the same Boolean search methodology. If your search is going to be local, it’s best to focus on those groups in your area. One of my colleagues is using in the Boston area meetup a group called “She Geeks Out,” and there are hundreds of other local meetup groups in your area that you probably don’t know about. Below is my Boolean search string that I’ve written that I want to share with you which is for a nationwide search. This search alone will give you the majority of all IT women professional profiles. 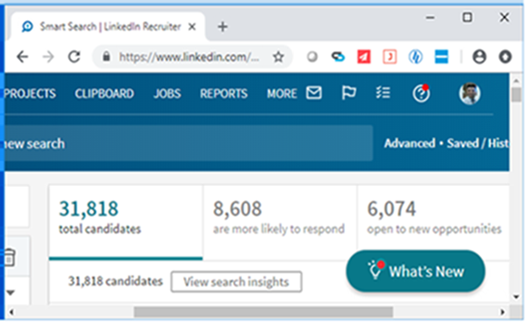 If you want to increase the number of candidates, add in meetup groups and other IT organizations or specific industry groups to your Boolean search string. 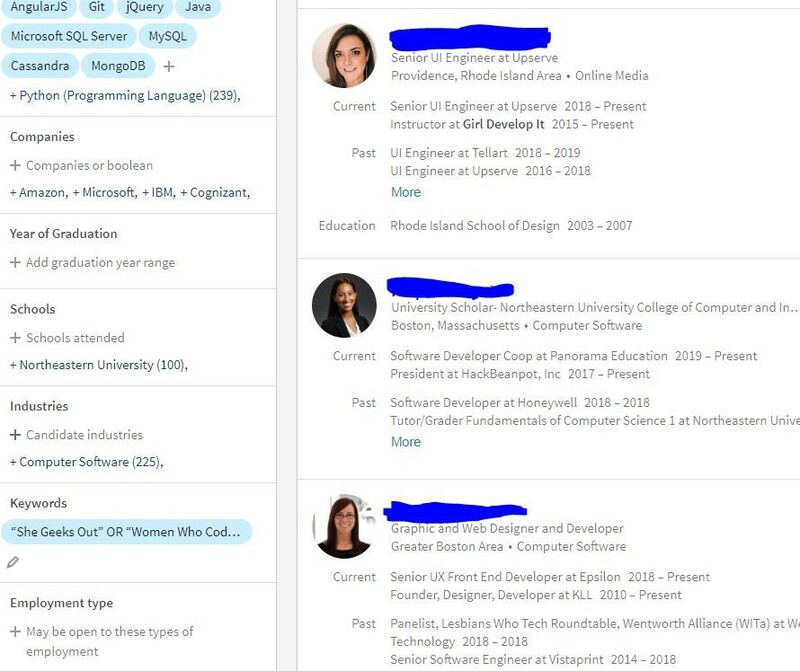 Let’s do a targeted search based on a specific type of female IT Professional that you’re sourcing. Full Stack Developers, Java Developers, and Python Developers are in high demand. To narrow down your search, enter in your skills like React.JS, Node.js, AngularJS, and then on the DB side enter MS SQL, Cassandra, or MongoDB. In this case, it reduced the search from 1,037 to 492 profiles. It’s important to start a diversity recruiting campaign that is genuine with your outreach. Your message needs a purpose. If you write a message that connects common interests, it will make a lasting impression. If you’re interested in making a difference in your company’s diversity headcount, I implore that you put together an action plan with your TA team. I have established my outline to better focus on a few action times. Talk to your TA team about diversity and get upper-level support. Work with your marketing team. Talk to your team about realistic metrics that they feel they can achieve on a monthly or quarterly basis. Strategize with your team about which sources will yield the best candidates. Develop a plan that can measure your team’s performance. Measure the increases in your employee’s headcount growth of women hires and compare it against the previous number of women that were with your organization. Tim Orrell has been a Technology Recruiter for over 13 years and has worked for various companies such as Dimension Data, DIRECTV, ePlus Technology, Carousel Industries, NTS Direct, Mood Media and many others. He's also LinkedIn Certified Recruiter that specializes in Boolean Search String Development, Gender Diversity Recruiting, Recruiter Mentoring & Development, Niche Sourcing Campaign Development, Strategic Pipeline Recruiting Efforts, & Live Sourcing Sourcing Presentations. Tim also has a deep passion for Various IT Vendor Platforms that allow him to have in-depth technical discussions with candidates that enable him to quantify a candidates experience during the screening process for his hiring managers.